Radium Baffle Plate - Lightning Motorsports - Selling Speed since 1996 ! The Radium Engineering PCV Baffle Plate mounts to the engine block and replaces the factory plastic PCV plate and valve. 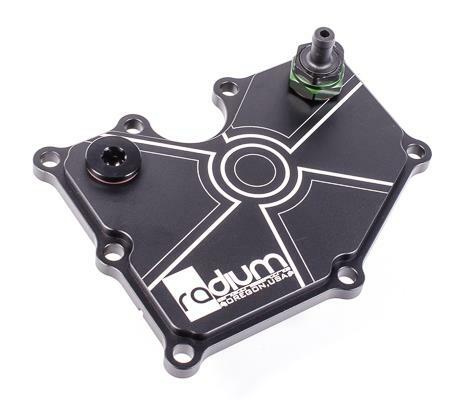 Compared to the OEM unit, the CNC machined aluminum Radium Engineering PCV plate features an extra baffle to prevent oil sludge from entering the intake system without restricting air flow. Furthermore, there are two 10AN ORB ports machined above both aluminum baffles. The OEM configuration kit includes all parts necessary for a plug and play installation and can be used with the OEM PCV tubing or with aftermarket Radium catch cans. Because the OEM Ford PCV valve leaks at all boost levels, this kit includes Radium’s own 10AN ORB PCV Valve which prevents boost from leaking into the crankcase. No permanent vehicle modifications are required. Exact contents of 20-0327-01 are shown in the picture below. This kit includes ONLY the Radium PCV plate and associated baffles. The twin 10AN ORB ports allow connection of breathers, catch cans, oil return lines, etc. for highly custom installations. IMPORTANT: If using with the Radium Engineering Focus RS/ST catch can kits, select the “OEM Configuration” option above. This will install perfectly with the PCV catch can kit and no other parts are needed.